Golden offers a complete line of generic and custom printed ATM rolls and fanfold receipts. They can be offset printed in up to four colors and are availabe for most printers including Diebold, Fujitsu, NCR, Triton and Tydel. We carry both bond and thermal transfer papers. Audit and journal rolls are also available. Golden offers one, two, and three ply POS rolls for use in most printers including Verifone and Epson. 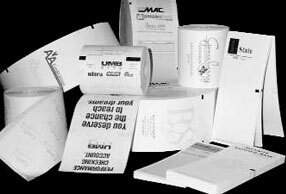 Our products are manufactured on Appleton Carbonless and Thermal transfer papers, and are either sold blank or custom printed. Appleton Thermal transfer papers are BPA free. Our capabilities to convert paper into small rolls or folded products and printed with offset presses offer a wide range of possibilities and ideas. Golden can manufacture any small roll application. Let us help you secure that next value added order. Call or email our customer service specialist to answer any question about these specialty roll products.